This tip is specific to Windows 8. The only way to change the font sizes in Windows 10 is by increasing the display %. 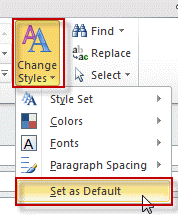 As we all know, Microsoft removed the ability to change the font and font size in the Outlook 2013 folder list. But all is not lost. For those people with high resolution monitors and/or poor vision there is something we can do short of enlarging the whole display image. Right click on the Windows 8 desktop and choose Personalize then click Display. There is an item "Change only text size". If you click on the dropdown you will see the items where you can change the text are Title Bars, Menus, Message Boxes, Palette Titles, Icons and Tool Tips. You cannot change the font, but you can change the size and make it bold. I found if I just change the menus size from 9 to 10 it makes the folder list text larger. It also increases the size of the ribbon which in my case is fine. One client changed almost everything to 12 which I think is a little over the top, but he really likes it. So if you are having trouble reading text in Office 2013 applications, play around with it and I think you will be able make some adjustments which will really improve the look and feel of outlook and other applications as well. If the font size in the message list is too large, you can change the size in View Settings, Other Settings and Conditional Formatting. In these screenshots, I changed the font from the default 9 pt to 10 pt. 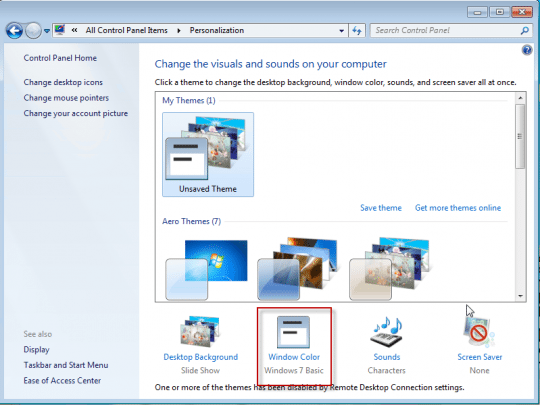 Although Windows 7 does not include the same options as Windows 8, you can still change the Menu font. Open Control Panel, Personalization. Click Window Color and find Menu in the list of Items. Published February 14, 2013. Last updated on June 15, 2017. Alternate Fontsizer works great. Enlarges all fonts in Outlook, except Email list and preview. Does similar in other programs as well. Fontsize 12 is a good average to use. by email list do you mean the to/from fields in an open message? The message list (center pane) can be changed - it has its own font settings under View settings. Preview is a problem - unless the message is plain text - for html you need to use the zoom command (or use a macro to zoom). can anybody help me change the font size for my folders in outlook 2016 in windows 10? 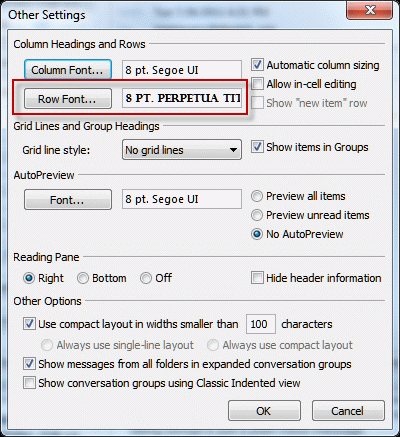 The fonts are not resizable within outlook. Sorry. 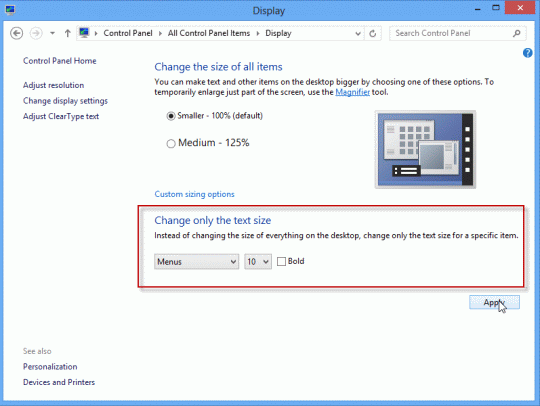 Or in windows 10 - you're limited to changing the display %. 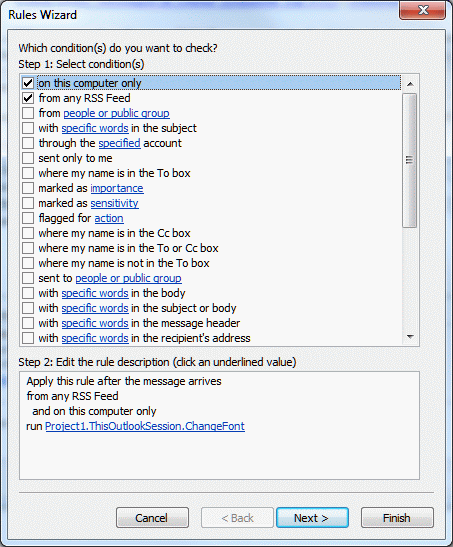 Thanks this article is helpful and relevant to Outlook users. Thanks! This worked on my Windows X, though I did have to hunt a bit to find the new hiding places for display, "change only text size" and the pull down menu! Can anyone tell me why the zoom scroll in the lower right corner might not move? I have Outlook13 /Windows 10. This email is killing my eyes! It is all small and all the same color. I was able to enlarge the email, but not the folder pane to the left. From what I read here, that is a function that was removed for some reason and all I can do is zoom in and out...but I cant zoom! The zoom control only works with the reading pane, not the folder list. The only thing you can do is enable touch mode - it won't change the text size (if it does, it would be a point or two) but it will spread the folders out a little. Some people think it helps, others find it annoying. The only other option is changing the windows display zoom, but it's generally not recommended to go too much above the recommended setting for your display. Changing the zoom will affect all applications.